Known to be quite placid creatures, elephants rarely lose their cool. But when the red mist of rage does descend, the results can be car-shatteringly spectacular. As this recently recorded amateur video suggests, never get on the wrong side of an elephant. Not only because they are liable to hold a grudge - but the large mammals can also stomp anything in their way into the ground. 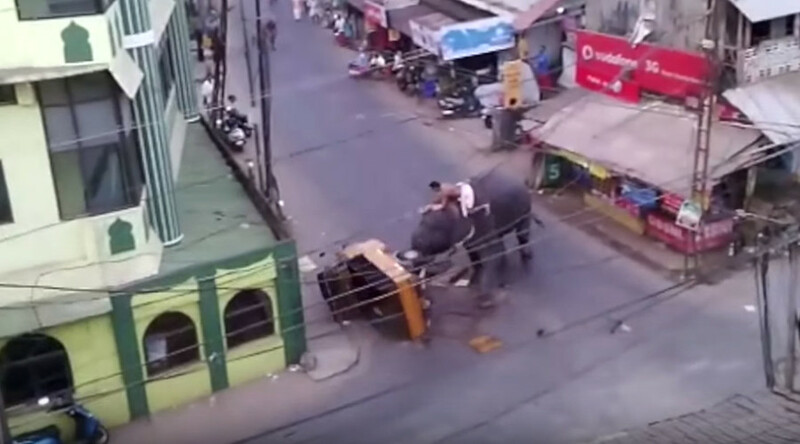 In a short clip filmed in Kozhikode city, Kerala, southwest India, a huge elephant can be seen rampaging through a residential area and taking out all its negative energy on an auto rickshaw. A mahout riding on the elephant’s back tries in vain to control the angry animal before seeing sense and jumping to safety. According to IndiaTV, the elephant turned violent during a temple festival in the city. In July last year, a similar incident was caught on tape in the Danish town of Karrebaeksminde after a handler beat a circus elephant with a stick. He won’t be doing that again in a hurry.